To improve the morphing quality, zoom in close to a morphing animation when compositing. Increasing the quality improves the line shape between vector points. It also creates a larger file, so only increase quality when you are zooming in close. 1. In the Timeline or Xsheet view, click on a cell in your morphing sequence. 2. In the Tools toolbar, select the Morphing tool or press [F3]. 3. 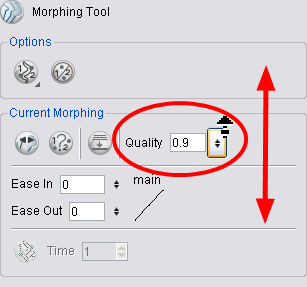 In the Tool Properties view, increase or decrease the quality level by dragging your cursor up or down. You can also type a new value directly in the text field.